But there is a very big problem for most of the newbie marketers that yes we have heard of email marketing, even want to adopt it but we don’t know how to step into it. If you’re also in the same dilemma we can guide some steps which help you in getting into Email Marketing and achieving success in it. Even if you’re not so new in the market yet you can adopt these steps to give a final touch to your most fascinating marketing technique. As we do with all of the new marketing strategies which we implement in our business, a lot of research. 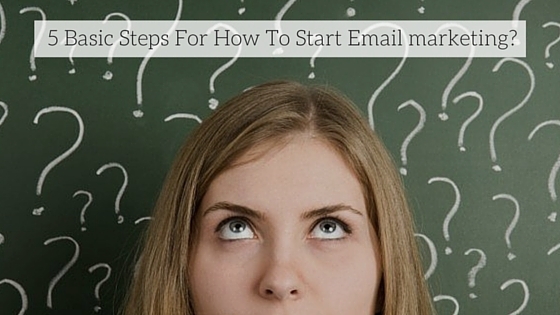 So, what you have to do with email marketing. It’s very necessary to decide why you’re going to use email marketing and the type of email you are going to send, for example, you want to promote your services or want to grab traffic to your website or want to share your every important update with your customer. Whatever the reason would be, make it very clear in your mind so that you can generate relevant kind of emails for you. Research also includes digging out the best company whom you can get connected to run your email panel. You also have to work on how you can create best emails so that it will actually get read by your customers rather than landing to the spam. There was a time when it was enough to dig more than a thousand emails at a time and start sending the emails through an email program and reaping its benefits but nowadays don’t even try this or you can be caught legally as committing a crime. So, it’s very important to go line by line with Can Spam Act, so that you can prevent yourself from committing any crime and doing any mistake in your business. So as a whole it can be said that in today’s date you have to owe your email list. Building the email list is the most important part of email marketing. There are a lot of ways through which you can easily create an email list. For example, you can create your email list through various social medias like Facebook, Twitter, linkedIn or Youtube, You can even use visual medias like Pinterest to grow your email list or even you can use the greatest video platform youtube to generate your email list. There are some old but gold methods as well which can help you in creating not only your emails list but harvesting your subscribers as well by using blogging, content marketing, article writing and much more such techniques you can get option emails of your customers. Creating an email template is not that easy if you really want your customers to read your emails. You should be very alert while creating your email template, email pixels, ratio of images, and many more criterions should be looked up very efficiently while creating a perfect and attractive email template. There is a very important part of email Subject lines. You can say it as the heart of your emails. So, use very efficient techniques to create a compelling subject line. Apart from creating an email template, testing is even important. So, before you throw your latest campaign try once either it is opening in mobile clearly. Does your call to action is compelling enough? It’s very necessary to test an email before you send it. You should keep in your mind the terms of mobile optimization, subject lines or good visuals while creating an email. It is very important to maintain a constant rhythm of your emails to your customer’s inbox. Even if you have created the best email list and generated the best email template but no is going to remember you if you’ll send your emails after a month. Making subscriber is not only is the procedure of snatching the customer’s email I.D but it promises to your customers to remain constant in their inbox. You don’t know why your subscriber has subscribed maybe he is interested in your services or can he or she likes your blogs or maybe he is a search of some discount. You would never know why a customer is subscribing. So, keep on delivering all your updates and newsletters to your customers. Remain constant and make them always remember you. The most important part of Email Marketing is is analyzation. You can use your every campaign as your new lesson. After doing all the things from template creation to testing of emails, it’s very important to shot your emails at a perfect time. And not only throwing you campaigns , it should be followed by the analyzation of that campaign by you. Your statistics will be enough to guide you that what are the mistakes you have done and from next time what you have done, what is the thing which worked for you in this campaign and what could be improved. So keep on tracking the result of your email campaign so that you can keep on improving yourself. maybe you’re not intended but it’s good to avoid becoming an accidental spammer. So, start checking your result and decline your probability to become a spammer. So these were the initial steps which you should keep in your mind if you’re going for email marketing. Stop thinking about it tie up lace and tighten your belt and start working for it.